"Americans don't want angry, defensive figures running for president," Democratic operative Will Marshall told McClatchy's David Lightman this week. But who, precisely, is angry and defensive? As the pushback to Wall Street's influence on government grows stronger, it is the banking industry's supporters who sound enraged. And as economic populism gains traction in Democratic circles, it is corporate Democrats like Marshall who find themselves increasingly on the defensive. Marshall and his organization (the misleadingly named "Progressive Policy Institute") are part of a corporate-financed movement that has tacked the Democratic Party sharply rightward in recent decades. Marshall was a member of the "Committee for the Liberation of Iraq," which pushed hard for the invasion of that country in 2002, and signed a letter from the Project for a New American Century promoting that cause. On the domestic front, Marshall's organization can be counted on to support such moves as last week's deregulatory gift to Wall Street (see here for more). Why are right-leaning Democrats like Marshall so worried? The answer may lie in the shifting internal dynamics of the Democratic Party itself. The financial crisis of 2008, the long-term economic issues that continue to plague the nation, and a growing public awareness of wealth inequality have all contributed to the consolidation of public opinion along economically populist lines. President Obama and other "centrists" largely managed to contain his party's populist wing throughout his first term. But the rise of Sen. Elizabeth Warren and her allies has emboldened what is now sometimes called the party's "Warren wing," as more and more Democrats sign on to the progressive populist agenda. The 2014 election may have been a teaching moment for many Democratic politicians. While most observers expected a poor showing for Democrats this year, the momentum against them exceeded most expectations. It bore all the signs of a "wave" election -- and the wave broke against conservative Democrats. They were understandably eager to shift the blame elsewhere. Despite their faction's long-term dominance of the party apparatus, McClatchy's Lightman reported that "former South Carolina Gov. James Hodges, a Democrat, warned that the party needs to break away from its reputation as liberal-driven." If this campaign didn't end that reputation, nothing will. What could have been less liberal than Kentucky senatorial candidate Alison Lundergan Grimes refusing to acknowledge that she voted for President Obama (himself a "centrist")? Arkansas Senator Mark Pryor ran a television ad that said, "The Bible teaches us that no one has all the answers, only God does, and neither political party is always right." These candidates didn't run as liberals. They barely ran as Democrats. Both Grimes and Pryor were defeated, by margins that were considerably larger than expected. James Hodges, who disdains the liberal label, was defeated years ago. He lost to Mark Sanford, later of "hiking the Appalachian trail" fame, in 2002. The "populist" economic agenda can loosely be defined as "government policies that reflect the needs and aspirations of the majority, rather than the privileged few." Its policy goals appear to enjoy broad public support. Polls show, for example, that 90 percent of Democrats and nearly three-quarters of Republicans support increasing Social Security benefits -- and raising taxes on millionaires to pay for it. Polling results compiled at PopulistMajority.org also reveal that 88 percent of those polled in November believe that the growing wealth gap between the rich and everyone else is bad for the country; that 63 percent of those polled believe the economy favors the wealthy; and that 75 percent of those polled in November support increased spending on infrastructure projects. Seventy-one percent of voters polled in October believe that the economy is stacked in favor of the wealthy. As for Wall Street: Two-thirds of voters polled believe that Wall Street financial institutions have made it more difficult to find good jobs in the United States. More than nine out of 10 people polled believe it is important to regulate financial services in order to ensure fairness toward customers; 83 percent believe that new rules should be implemented for Wall Street and that bankers should be held accountable for the actions that caused the financial crisis. Some additional figures help explain the 2014 election results, including its low turnout: 73 percent of voters in Senate battleground supported increasing taxes on corporate overseas profits to ensure they pay the same amount as on U.S. profits. Sixty-two percent supported increasing taxes on the wealthy and corporations to fund priorities such as education and job training. Sixty-seven percent of voters believed that government investment in economic growth was a higher priority than cutting taxes. These populist positions went unrepresented in many, if not most, 2014 races. Disaffection with the president's performance -- another sign of the under-performing economy -- helped fuel GOP successes. But even as "centrist" Democrats performed poorly, populist and progressive ballot initiatives did very well. This suggests that a more populist Democratic Party might have fared considerably better. The election's historically low turnout also suggests that neither party excited voters with its platform. According to the polls, a populist platform would've helped considerably. It's no surprise that "centrist" Democrats are troubled by the challenge posed by senators like Warren, Ohio's Sherrod Brown, and Vermont's Bernie Sanders. These senators' positions aren't just good policy; they're good politics, too. While the well-funded "centrists" have too much money and media influence to be counted out, this movement poses a real threat to their dominance over the Democratic Party. That may lead some people to grasp at straws, like a recent article in The Atlantic by Amitai Etzioni that sought to draw a distinction between something he called "popular populism" and a "leftist" variety. But that distinction doesn't exist, and Etzioni's attempt is an exercise in chasing shadows. But when it comes to the current Democratic divide, it's also irrelevant. Etzioni is ascribing positions to the "Elizabeth Warren camp" that it doesn't hold. That faction's populism isn't based on welfare programs or redistributionism, and its on positions on taxing the wealthy and corporations -- more accurately described as bulwarks against further wealth transfer upward -- are extremely popular. Etzioni concludes that "If a left-wing Democrat beats the odds and wins the party's nod ... it is sure to help a Republican be elected." That's only true of the imaginary, Clifford Odets-like figure he conjures from his imagination. 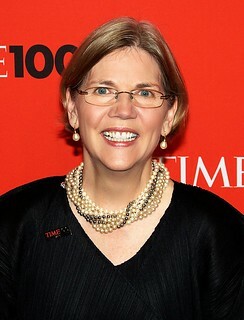 A real populist in the Warren party could give it a huge boost, according to the data. From the Washington Post's Dan Balz comes data from a much smaller sample size. That makes it preliminary at best. But it may augur even more poorly for the future of the "centrist" crowd. Balz writes of a focus group conducted by pollster Peter Hart that had an unexpected outcome. "The 12 participants -- Democrats, Republicans and independents -- are weary of political dynasties," writes Balz. "They were dismissive, sometimes harshly, in their assessments of Bush, the former Florida governor. They were also chilly toward former secretary of state Hillary Rodham Clinton." Balz continues: "When the name of Sen. Elizabeth Warren was introduced into the conversation, however, many of those around the table, regardless of party affiliation, responded positively. To this group, who spoke in stark terms throughout the evening about the economic challenges of working Americans, Warren has struck a chord." Balz quoted Hart as saying, "You couldn't leave this without feeling how hard-pressed these people are and how they're looking for someone who will be a voice for their cause. And Elizabeth Warren has broken through." "That, (Hart) added, was wholly unexpected when the focus group was organized." That sort of surprise outcome is precisely what the "centrist" Dems hope to avoid in 2016, and they are locked in a fierce battle to prevent it -- even if their party, and their country, must pay a price for their aspirations. Observers need to replace the words "centrist" and "moderate" with more precise terms. If the "center" lies between the opinions of "liberals" and "conservatives," those words do not accurately describe people whose policy positions are frequently and demonstrably to the right of what most Republicans believe.